With Trafalgar you have a more meaningful choice of trips and in-depth experiences than any other guided travel company. Trafalgar has been creating exceptional guided holidays for almost 70 years. With more than 230 trips to worldwide destinations, including Europe, North, Central and South America, Asia and Africa, we continue to offer new ways to travel every year. Trafalgar are the Real Insiders No one has been able to come close to establishing anything like our network of local characters; from chefs and artisans to historians, farmers and even taxi drivers. You’ll eat with them, drink with them; listen to their stories. You’ll find they’ll open up your understanding of your destination in ways you never imagined. Trafalgar offer Real Choice We offer more destinations and more types of holiday than any other guided travel operator. Take a look at our trip types. You’ll find there’s a range of travel styles to suit you. Trafalgar provide Real Flexibility There’s always an element of free time and flexibility built-in, and there’s often a range of trips and Optional Experiences to choose from. Real Ease You’ll be a VIP: enjoy exclusive access to selected sights, avoid queues at major attractions, benefit from luggage porterage right to your room, and stay in carefully selected hotels. We deliver what we promise: the real deal. View all the fine print here - it's really not that bad! Trafalgar has been creating exceptional guided holidays for almost 70 years. With more than 230 trips to worldwide destinations, including Europe, North, Central and South America, Asia and Africa, we continue to offer new ways to travel every year. We were the first to create Insider Experiences; enabling our guests to appreciate their destination through genuine local experiences, such as dining with locals in their homes. And we continue to evolve guided travel in new directions. Travel is our passion. See it for yourself in what our guests say on social media, and how we’ve won more awards than any other guided travel company. The beauty of taking a guided holiday with us is you will have the opportunity to meet and travel with people from all over the world. By travelling with an international company, you'll forge friendships with people from countries as diverse as the United States, Canada, Europe, New Zealand, South Africa, Singapore and the United Kingdom. How many people are on a Trafalgar holiday with me? On Trafalgar guided holidays you will find an average of between 40 and 45 guests on itineraries throughout Europe. There will be a maximum of 52 guests on Trafalgar trips throughout the United States and Canada. On our new Hidden Journeys guided holidays, there is a maximum 26 guests on each itinerary. We design each itinerary with the perfect balance of planned activities and personal time to explore. We also give you the opportunity to personalise your trip with a range of Optional Excursions at competitive rates, which allow you to choose how you spend some of your time. You might choose to enjoy some of the best seats in the house at the world-famous Moulin Rouge in Paris. Or maybe take a magical early-morning balloon ride over the Napa Valley – the choice is yours. If you're after extra time for independent sightseeing, our At Leisure range of guided holidays offer a more relaxed pace holiday with two or three nights stay in each location. Enjoy late starts and spend more time exploring with the option to experience each destination as you wish. No matter where you travel with us, you'll always relax in comfort and safety on board our modern coaches. We pride ourselves on having the finest fleet of fuel-efficient, fully air conditioned coaches all with reclining seats and an on-board restroom for your convenience. The high vantage point from your coach's window means you can take in all the glorious scenery whether it's in a vast rural landscape or an urban city centre, no matter what destinations you visit on your guided holiday. We select our hotels for their quality, impeccable service and comfort, with the majority of them having air-conditioning. Few hotels in the northern Alps of Europe have air conditioning due to the colder climate, however you will find all our selected hotels maintain comfortable temperatures and a range of amenities. What are the Travel Directors like? What are Trafalgar’s different trip styles? With 7 core trip styles and 3 other trip styles, we have more trip styles to choose from than any other guided travel company. Our core trip styles all offer these Trafalgar Essentials: Insider Experiences, ease, free time and flexibility. Our other trip styles provide different inclusions, but still offer Trafalgar Quality. What is the difference between visit, view and see in the itineraries? To assist you in browsing our trips online or within our brochures, there are some common terms used throughout our itineraries: Visit - The coach will stop and you will visit a specific site. The entrance fee is included in the guided holiday. View - A brief stop and view from the outside. This is a great opportunity for you to take photos. See - The coach will drive by the site so that you can see it. Sightseeing tour - A Local Guide or Expert will accompany you on a tour of the town, city or site. Orientation tour - Places of interest will be identified, after which you will have plenty of time to explore independently. 'Why not see' or 'perhaps enjoy' - These phrases refer to Optional Excursions not included in the guided holiday package, but are available from your Travel Director at a competitive and affordable price. Time to explore and discover — You will have free time on your own for independent sightseeing and discovering the city or town on your own. A day to relax — There are no planned activities, giving you time for Optional Excursions, independent sightseeing or simply relaxing and taking in the destination. How does Trafalgar support sustainable tourism and protect the environment? Trafalgar is a founding partner of The Travel Corporation's Conservation Foundation, a non-profit organisation established in 2008. So far, the Foundation has committed over US2 million to help underprivileged communities and support sustainable tourism around the world. The Foundation is also proud to support the National Trust in its project to build new environmentally sustainable visitor facilities at Northern Ireland's iconic World Heritage listed Giant's Causeway. What is Gold Seal Protection? Gold Seal Protection is the most effective tool to give you peace of mind. For only $99* should you choose to cancel your guided holiday for any reason, prior to departure from Australia, we will refund your deposit and/or guided holiday payment. Gold Seal Protection must be paid with the deposit and cannot be added at any later date. Full Gold Seal protection details and conditions are found within each Trafalgar brochure which can be viewed from this this web page. *Prices are subject to change without notice. Travelling as a group is easy on any one of our guided holidays. Groups of between five to eight people, when travelling together qualify for a 5% discount to the LAND-only portion of the holiday. If nine or more guests travel together, we offer attractive group discounts based on the number of people travelling. So it pays to get together with your family and friends! What happens if I am travelling alone? Is there an extra charge? We strongly recommend that all guests have a travel insurance policy to ensure your peace of mind before and whilst travelling. It's important that you protect yourself in case of trip cancellations, an interruption for any reason, baggage delays or loss of baggage and medical expenses. Passports are needed when travelling outside your home country. Your passport should be valid for at least six months beyond the conclusion of your trip. You are responsible for obtaining all necessary visas prior to the departure of your guided holiday. Depending on your nationality, you may need visas to enter certain countries included on your trip. Please note that obtaining visas can take up to six weeks prior to your departure. It is strongly advised that you consult GTD and the local Consulate or Embassy of the country you are visiting well in advance to determine which visas they require and how to obtain them. To assist you in this process, we recommend that you visit www.smartraveller.gov.au for general information or www.visalink.com.au to provide you with a comprehensive visa service. We recommend you do this two months prior to your departure from Australia. We will also be able to quickly locate you or your nominated contact in the unlikely event of an emergency. Please complete the express check-in as soon as possible after booking your holiday — find out more at www.trafalgar.com All your details are kept secure and we will not share your information with third parties. When will I receive my documents from Trafalgar? Travel documents are usually sent 21 days prior to your trip's departure. We can accommodate guests who are vegetarian and can assist with diabetic, gluten-free and other medically-recommended diets. Please advise us at time of booking. Unfortunately, we’re unable to supply meals in accordance with strict religious requirements. We can’t provide salt-free, Kosher, Halal, requests for specific dietary supplements such as soya milk, and high protein or low-carb meals. Do you have a frequent traveller program? Yes, you can join our Trafalgar Travel Club at the end of your trip by completing the feedback questionnaire. Membership is free and as a Travel Club member you'll have access to great promotional benefits and be entitled to a 5% discount on your next guided holiday. Yes, all hotel baggage handling is provided at no extra charge and included in your holiday purchase price. One suitcase per person will be brought to your hotel room. Currency can be exchanged at airports or banks. International debit and credit cards are accepted at most bank machines (ATMs) throughout the world. It is a good idea to check with your bank prior to your departure, to be sure that your cards operate in the destinations in which you a travelling. We’ll check you in, look after your luggage and take care of all hotel porterage, tips and gratuities –whether it is for restaurant staff, chambermaids or porters. On a majority of itineraries you have the option to pre-pay gratuities for your Travel Director and Driver. Be sure to ask GTD for the pre-paid gratuity amount. Be sure to check at the time of booking if gratuities are included in your holiday package. If you prefer to not pre-pay gratuities, the recommended amounts are as follows: Travel Directors EUR4/US6/CA6 per person, per day Drivers EUR2.50/US3/CA3 per person, per day Local Guides and Specialists EUR1/US2/CA2 per person, per day. Yes, in most circumstances you are able to travel with a wheelchair on your trip as long as you are travelling with a person who is willing and able to provide personal assistance. Please advise us at the time of booking if you plan to bring a wheelchair to ensure we can meet your requirements. What type of outfits do I pack and will I need formal attire? This will depend on not only your personal preference, but the destinations you are visiting and the time of year you will be travelling. It is advisable to bring at least one 'smart' outfit for special evenings or Highlight Dinners. If your itinerary visits churches or places of worship, you may be required to wear items that cover your shoulders and in some cases, knees. When travelling, we recommend bringing items that are casual and lightweight, and require little or no ironing. Weather varies in different parts of the world, between each destination and the time of year in which you choose to travel. It is always advisable to check the weather forecast before you travel as this will help you to determine what to pack for your holiday. You can find out local weather conditions throughout various websites such as www.weather.com. What are Optional Excursions and when do I purchase them? Must I know the native languages of the countries I am visiting? While it is a nice gesture to greet local people in their native language, it is not essential as your Travel Director will normally be able to help you. They will teach you common phrases and be there to offer friendly assistance. Generally, a mobile phone is often the easiest way to communicate with others back home. Be sure to check with your service provider of their coverage and costs when outside your home country. When making a phone call from your hotel room, almost all hotels will add a service charge to the cost of any calls. This charge can be high, especially for international calls. It is generally cheaper to use public phones (pay phones) or obtain an international calling card. Depending on the countries you are visiting, internet facilities are generally available in most hotels at a charge, for those guests wishing to use their lap top or mobile internet device. Yes, your Travel Director will implement a seat rotation system, whereby all guests will rotate their seats on the coach daily. This allows for everyone to experience the spectacular views from different seats, and you'll have a better opportunity to get to know your fellow travellers. Your Travel Director will assist you with a doctor's visit or hospitalisation should you require. Trafalgar has a dedicated Customer Care Department in Europe or our Operations Department in the relevant country will contact you to offer assistance and advice, coordinate with your travel insurance company and keep in touch until you are able to re-join the trip or return home. This service is included in the cost of your trip; however it is not a replacement for travel insurance, which we strongly advise all travellers to purchase. Can I drink the water in the countries I will visit on my trip? In Britain, Western Europe, Scandinavia, the United States, Canada, Australia and New Zealand the answer is yes. For other countries visited you will be informed by your Travel Director. Is smoking allowed on the coach? There is a no smoking policy when on board the coach. We do, however make plenty of comfort stops, allowing you ample opportunity to smoke outside if you wish, stretch your legs, take a scenic snapshot or enjoy a cup of coffee. What is the London Reception Centre and what facilities does it offer? Our Local Hosts also visit your hotel daily, if your accommodation has been booked through Trafalgar. Check the hotel noticeboard or ask the concierge for visiting hours. Your Host will provide departure information, help you book London sightseeing trips and tickets and assist you in any way they can. Transfers will depend on the guided holiday you choose and vary amongst destinations. In general, if you are joining and departing your guided holiday on the first or last day, return transfers between the airport and hotel are included (excludes itineraries starting and/or ending in London). Should you extend your stay with additional nights accommodation before or after your guided holiday booked through Trafalgar, you may be able to purchase transfers at an additional cost. If you are unsure please ask GTD about your specific airport transfer information. Welcome to Rome - once the capital of the world and today the vibrant Italian capital, which you`ll have an opportunity to explore before joining your Travel Director and fellow travellers for a Welcome Reception this evening. Your introduction to Rome will see you embark on an orientation drive to admire some of the city highlights. We visit the Vatican City this morning, joining an included sightseeing tour with a Local Specialist to see Michelangelo`s magnificent Pieta inside St. Peter`s Basilica. Walk in the footsteps of millions of pilgrims to St. Peters Square before continuing to Ancient Rome. Imagine the exhilarating cries of thousands of spectators cheering their favourites to victory at Circus Maximus and visit the impressive Colosseum where gladiators and slaves once fought to their deaths. Enjoy some free time this afternoon to explore the city on your own, or simply relax on the Spanish Steps watching the world go by. We venture north to Pisa and visit the Square of Miracles with its medieval Cathedral, Romanesque Baptistery and see the Leaning Tower. A short drive takes us to Florence, the Cradle of the Renaissance, once a vibrant republic under the rule of the dynamic Medici family whose love for art and antiquities created one of the world`s most cultural cities. The magnificent marble Duomo, Santa Croce Basilica, Ponte Vecchio and Piazza della Signoria feature on our walking tour with a Local Specialist through Florence`s streets. Learn about the quality and workmanship of one of this city`s historic industries at a demonstration of Florentine leathercraft. Then, enjoy a leisurely evening soaking up the atmosphere of the Queen of the Adriatic or consider an Optional Experience, navigating the city`s elegant canals from the comfort of a traditional gondola. `Dive Into Culture` and witness the centuries-old craft of glassblowing on Giudecca Island. Embark on an orientation cruise by private launch to the gateway of Venice, St. Mark`s Square. See the Doge`s Palace, St. Mark`s Cathedral and the Bridge of Sighs. The rest of the afternoon is yours to explore more of the city`s sights. We drive south through the golden fields of Umbria to the green heart of Italy, stopping at the mystical medieval hilltop town of Assisi, most famous for being the birthplace of St. Francis. Join a Local Specialist for a walking tour of the town, which includes a visit to the Basilica of St. Francis to view its magnificent frescoes and carvings. We pay homage to the thousands of brave souls who lost their lives during the Battle of Monte Cassino, stopping at the Commonwealth War Cemetery en route to the tragic city of Pompeii, which was engulfed during the eruption of Mount Vesuvius. For centuries, the city was lost to the world - its rediscovery in the 18th-century revealing a time capsule of well-preserved ruins that provides insights into the day-to-day life of a Roman city centuries ago. Join a Local Specialist to delve into the city`s history before travelling to Naples for your overnight cruise to Palermo, Sicily`s fiery capital. We arrive this morning in Palermo, known for its lavish architecture and gardens. We join our Local Specialist for a sightseeing tour, which includes the Teatro Massimo and Piazza Bellini, located in the heart of the city. We continue to the town of Monreale on the slopes of Monte Caputo overlooking the orange, olive and almond groves of La Conca d`Oro, where we`ll visit the magnificent 12th-century Norman Cathedral before returning to Palermo this afternoon. Visit the lively seaside town of Mondello before continuing your journey to Agrigento. Join a Local Specialist to tour the impressive Greek Valley of Temples dating back to 6th-century BC. This evening we dine in our hotel. We travel through the vineyards of the southern hills towards the seaside resort of Taormina, your home for the next two nights. Enjoy spectacular vistas and a taste of la dolce vita in this hillside town, enjoying free time on arrival. Spend the day relaxing at your chic Sicilian resort. Dive into the warm Mediterranean waters, shop for exquisite handmade lace on Via Corso Umberto or indulge in a mulberry granita. Consider joining an Optional Experience to Savoca, the village made famous by `The Godfather`, and Europe`s most active volcano, Mount Etna. This evening, `Connect With Locals` during a Be My Guest dinner hosted at a vineyard on the slopes of Mount Etna. 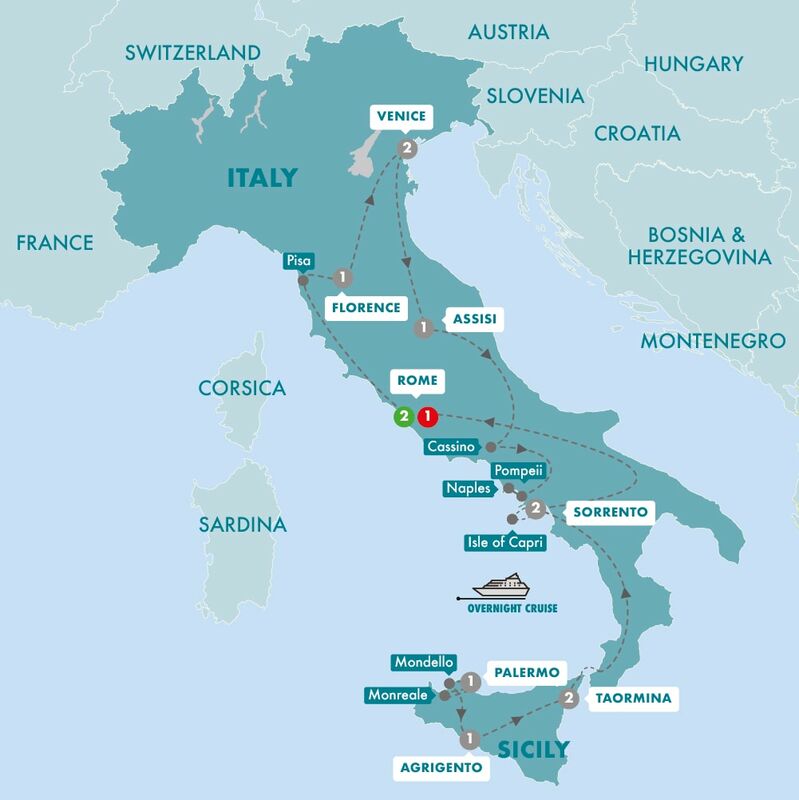 Today we cross the Straits of Messina to mainland Italy by ferry, driving north through rustic Calabria via Salerno to our hotel in Sorrento where we`ll spend the next two nights. We cruise to the Isle of Capri where we`ll enjoy a guided walking tour of Capri Town with a Local Specialist. Stroll through its stylish lanes, window shop along Via Camerelle and watch the beautiful people in the Piazzetta, before returning to Sorrento, where you will have the evening at leisure to indulge in a little limoncello at Piazza Tasso, with its many cafes. Admire the dramatic coastline, driving north from Sorrento to the Eternal City of Rome. This afternoon, we `Dive Into Culture` gaining priority access to the Vatican Museums where a Local Specialist will take us on a guided tour. Admire Michelangelo`s magnificent 16th century frescoed ceiling of the Sistine Chapel and see the array of exquisite artefacts at the Museo Gregoriano Profano, founded in the Lateran Apostolic Palace at the behest of Gregory XVI Cappellari in 1844. You`ll also enjoy an exclusive al fresco Farewell Dinner against the spectacular backdrop of St. Peter`s. For now it`s a fond Ciao Roma as we prepare to depart for our journey home. Transfers are available. Conditions apply. Zoom in and take a closer look at each city you will visit. Below you will find the basic route in which you will travel on this tour.